Porridge plantain is one of the delicious foods that are made and eaten in Nigeria. Frankly, this meal doesn’t appear often in my menu but anytime I decide to make it, I do really enjoy it. Plantain porridge or porridge plantain is easy to prepare, it takes the same process as Porridge Yam, although, with a little twist and slight changes in ingredients. 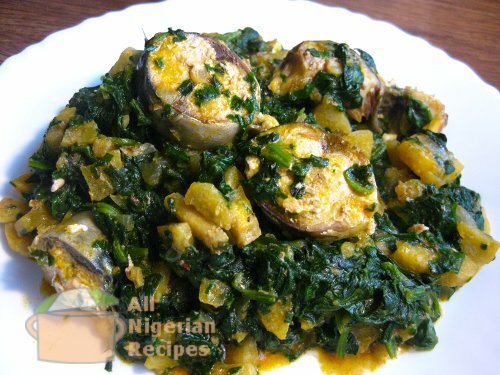 This delicious meal is usually made with unripe plantain, however, you can use a combination of ripe and unripe plantain, most people do this in other to achieve a faint sugary taste. This meal (unripe plantain porridge) is very rich in iron and highly recommended for diabetic patients. If you are searching for Nigerian foods for diabetic patients I would recommend unripe plantain first, you can chose to prepare it anyhow. In this case we are making a porridge/pottage out of it. Oh, I forgot to finish a sentence I started above, the unripe plantain is very rich in iron but once it is ripe, it becomes carbohydrate and no more safe for diabetic patients. However, anybody can enjoy this delicious meal, doesn’t it look really delicious? Like I did state initially, you can use ripe or unripe plantain. I decided to use a blend of goat meat and few slice of fish. You can use just fish, goat meat or even non of both. Stock fish is also really nice in plantain porridge, you are always welcome to try new things. You can chose to add vegetables, as much vegetable as you want, fluted pumpkin is a good choice. However, I did not include vegetables in the meal above. This is really easy, just parboil the goat meat with one cubes of maggi, salt and any other spice or flavor of choice. allow the water to dry, add more water and cook until the meat is soft for consumption. introduce the fish and add another cube of maggi, a bulb of onions and a little more salt. peal off the green outer layer of the plantain and slice to any size of your choice. also go ahead and slice the tomatoes, peppers and also do the same to the remaining one bulb of onions. Once the meat and fish is properly parboiled, you can remove the fish and continue cooking with the meat. Add about 10cl of red (palm) oil, add a cup of water (about 75cl), about two spoon of ground crayfish, salt to taste. You may also add another cube of maggi if the solution is not as tasty as you require. Add the sliced plantain, spray the sliced tomato/onions/fresh pepper at the top, add the fish and cover to cook for 15-20 minutes. Stir all together and you just made a delicious plantain porridge. You can serve this meal with a chilled bottle of your favorite drink.